I really like Kingston flash drives; they have never failed me. They've been dropped, run through the washing machine/dryer, and generally put through a beating, but they just keep going. Their main competition is Sandisk and I hate how they always run that stupid program when you plug it in. (This program wouldn't work on my high school's computers a couple years ago, as they were seen as a security threat, making them useless...) As for this particular one, It's got a fast read/write speed and I haven't seen any problems except the storage size. It says 7.2GB on my computer but it's labeled 8GB... However, this always happens with EVERYTHING dealing with storage, so it's nothing. 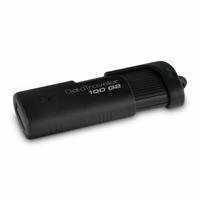 Comments on "USB flash drives: Kingston Digital Inc. 8GB DataTraveler"